The 2013 Bioinformatics Open Source Conference (BOSC) starts tomorrow in Berlin, Germany. It’s a yearly conference devoted to community-based software development projects supporting biological research. Members of the Open Bioinformatics Foundation discuss implementations and approaches to better provide interoperable and reusable software, libraries and pipelines. During the Codefest, we tested and documented our port of the BaseSpace Python SDK to Ruby. Ruby/Biogem developers can now easily utilize next-generation sequencing code within the Illumina’s BaseSpace framework. For non-Ruby programers, we found that it can be a burden to create new Web app from scratch on top of your NGS program. So we started new project to provide a Web-app scaffold for BaseSpace. We have already implemented the basic portion but will need some more time before releasing the BioBaseSpace application. 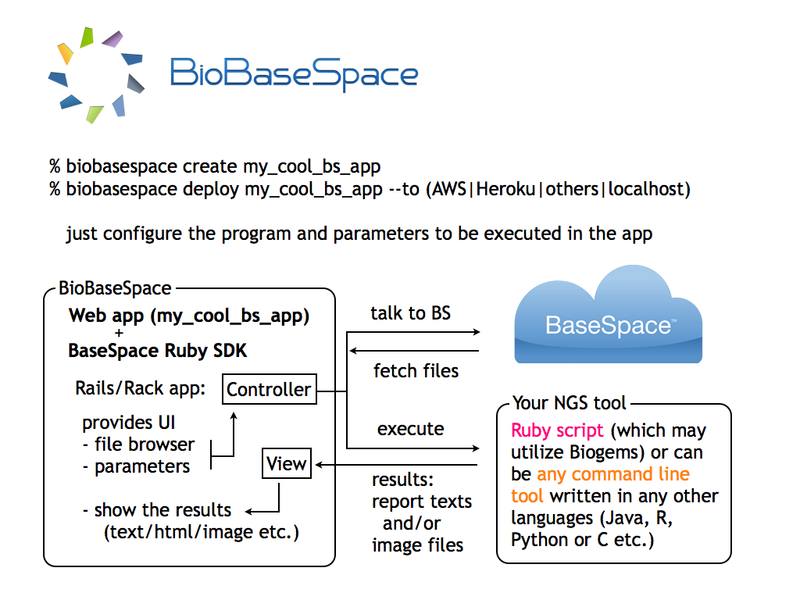 The BaseSpace Ruby SDK was officially released: for more information, see Joachim’s blog post, the official announcement from the BioRuby team and the annoucement from Illumina. We worked toward inclusion of the EDAM onotology as part of the Mobyle system’s built-in type and classification mechanisms. We created a user case by identify workflows in Mobyle and mapped the descriptions unto EDAM classification to allow mapping between the types. We also investigated the possibilities opened by projects such as PROV to standardize the provenance information stored by systems such as Mobyle. We added a prototype functionality to the development version of Mobyle that dynamically generates this provenance information in a JSON-based format. On April 7th and 8th, a group of biologists and programmers gathered at the Broad Institute to work on improving interoperability of open-source bioinformatics tools. Organized by the Open Bioinformatics Foundation and GenomeSpace team, this was part of the lead up to the Bioinformatics Open Source Conference (BOSC) in July in Berlin. The event is part of an ongoing series of coding sessions (Codefests or Hackathons) organized by the open bioinformatics community, which give programmers who typically work together remotely a chance to code and discuss in the same place for two days. These have been successful in both producing new code and in building connections which help sustain development of these community projects. One major challenge in analyzing biological data is interfacing multiple bioinformatics tools. Tools often work independently, and where general architectures like plugins or API exist they are often project specific. This results in isolated islands of data exchange, but transferring data or resources between tools requires work that is often rate-limiting or insurmountable. Our goal at the hackathon was to provide simple APIs and implementations that help facilitate transfers between multiple islands of functionality. GenomeSpace does this by providing a central hub and API to push and pull from tools. We wanted to generalize this to support multiple tools, and build client implementations that demonstrate this in practice. The long term goal is to encourage tool developers to provide server side APIs compatible with the more general library, making extension of the connector toolkit easier. For developers, the client API would allow them to easily transfer files between multiple tools without needing to learn and implement the specific transfer APIs of each tool. File metadata: We need to be able to store arbitrary key/value on objects to assign essential biological information necessary to interpret it, like organisms and genome build. In addition, metadata allows provenance and tracking of files by enabling annotation of files with history and processing steps. Filesets: Large biological files have secondary files with indexes, allowing indexed retrieval of data (for example: read bam and bai, variant vcf and idx, tabix gz and tbi). To avoid expensive reindexing, we want to group and transfer these together. We also identified other useful extensions that would help improve interoperability and facilitate building connected tools, like providing Publish/subscribe hooks to avoid having to poll servers for updates, and smarter approaches to sending data to avoid duplication and unnecessary transfer of data. The output of our discussion and coding are common Genome Connector implementations in multiple languages. GitHub repositories are available for in-progress Java, Python and Clojure implementations. These wrap multiple diverse tools and expose them through a common top level API, allowing developers to push and pull data from multiple tools. I’m immensely grateful to the incredible participants who generously donated their time and expertise to help with these projects. For anyone interested we also have detailed documentation on discussions during the hackathon. If you’re a bioinformatics programmers interested in open source coding and helping answer biological questions by improving usability and connectivity of tools, you’re welcome to join the OpenBio and BOSC communities. We’ve created a biological interoperability mailing list for additional discussion. The next BOSC conference is July 19th and 20th in Berlin, Germany as part of the ISMB conference. There will also be another two day Codefest proceeding BOSC on July 17th and 18th. Abstracts for talks at BOSC are due this Friday, April 12th. Looking forward to seeing everyone at future BOSC and coding events. Next generation sequencing technologies like Illumina, SOLiD and 454 have provided core facilities with the ability to produce large amounts of sequence data. Along with this increased output comes the challenge of managing requests and samples, tracking sequencing runs, and automating downstream analyses. Our group at Massachusetts General Hospital approached these challenges by developing a sample submission and tracking interface on top of the web-based Galaxy data integration platform. It provides a front end for biologists to enter their sample details and monitor the status of a project. For lab technicians doing the sample preparation and sequencing work, the system tracks sample states via a set of progressive queues providing data entry points at each step of the process. On the back end, an automated analysis pipeline processes data as it arrives off the sequencer, uploading the results back into Galaxy. This post will show videos of the interface in action, describe installation and extension of the system, and detail the implementation architecture. Biologists use a local Galaxy server as an entry point to submit samples for sequencing. This provides a familiar interface and central location for both entering sample information and retrieving and analyzing the sequencing data. Practically, a user begins by browsing to the sample submission page. There they are presented with a wizard interface which guides them through entry of sample details. Multiplexed samples are supported through a drag and drop interface. When all samples are entered, the user submits them as a sequencing project. This includes billing information and a project name to facilitate communication between the researcher and the core group about submissions. Users are able to view their submissions grouped as projects and track the state of constructs. Since we support a number of services in addition to sequencing — like library construction, quantitation and validation — this is a valuable way for users to track and organize their requests. Administrators and sequencing technicians have access to additional functionality to help manage the internal sample preparation and sequencing workflow. The main sample tracking interface centers around a set of queues; each queue represents a state that a sample can be in. Samples move through the queues as they are processed, with additional information being added to the sample at each step. For instance, a sample in the ‘Pre-sequencing quantitation’ queue moves to the ‘Sequencing’ queue once it has been fully quantitated, with that quantitation information entered by the sequencing technician during the transition. Assigning samples to flow cells occurs using a drag and drop jQueryUI interface. The design is flexible to allow for placing samples across multiple lanes or multiplexing multiple barcoded samples into a single lane. Running a sequencing machine requires careful monitoring of results and our interface provides several ways to view this data. Raw cluster and read counts are linked to a list of runs. For higher level analyses, interactive plots are available for viewing reads over time and pass rates compared to read density. These allow adjustment of experimental procedures to maximize useful reads based on current machine chemistry. Alignment with bowtie or bwa. Generation of alignment and read statistics with Picard, the fastx toolkit and SolexaQA. Preparation of a summary PDF with detailed statistics about the run and alignment. Variant effect prediction with snpEff. Fastq reads, alignments files, summary PDFs and other associated files are uploaded back into into Galaxy Data Libraries organized by sample names. Users can download results for offline work, or import them directly into their Galaxy history for further analysis or display. The code base is maintained as a Bitbucket repository that tracks the main galaxy-central distribution. It is updated from the main site regularly to maintain compatibility, with the future goal of integrating a generalized version into the main source tree. Detailed installation instructions are available for setting up the front-end client. The analysis pipeline is written in Python and drives a number of open source programs; it is available as a GitHub repository with documentation and installation instructions. We are using the current system in production and continue to develop and add features based on user feedback. We would like to generalize this for other research cores with additional instruments and services, and would be happy to hear from developers working on this type of system for their facilities. This work would not have been possible without the great open source toolkits and frameworks that it builds on. Galaxy provides not only an analysis framework, but also a ready to use database structure for managing samples and requests. The front end builds off existing Galaxy sample tracking work, and requires only two new database storage tables. By reusing and expanding the great work of the Galaxy team, we hope to eventually integrate useful parts of this work into the Galaxy codebase. Coupled with the software images, this volume makes it easy to do next-gen analyses. Start up an Amazon AMI, attach the genome data volume, transfer your fastq file to the instance, and kick off the analysis. The overhead of software installation and genome indexing is completely removed. Thanks to the work of Enis Afgan and James Taylor of Galaxy, the data volume plugs directly into Galaxy’s ready to use cloud image. Coupling the data and software with Galaxy provides a familiar web interface for running tools and developing biological workflows. Bela Tiwari of the NEBC Bio-Linux team has written an excellent introduction to Amazon EC2 and CloudBioLinux. This breaks down the process of signing up for an account, creating a software image, associating data volumes and setting up a graphical server. It’s a great place to get started with CloudBioLinux. My presentation on the open source community behind CloudBioLinux from Amazon’s Genomic Data workshop. This details the project goals and automated code organization. It was amazing and inspiring to get such positive feedback from so many members of the bioinformatics community. We’re planning another session next year in Vienna, again just before BOSC and ISMB 2011; and again, everyone is welcome. Go to the CloudBioLinux website for the latest publicly available images and data volumes, which are ready to use on Amazon EC2. With Amazon’s new micro-images you can start analyzing data for only a few cents an hour. It’s an easy way to explore if cloud resources will help with computational demands in your work. We’re very interested in feedback and happy to have other developers helping out; please get in touch on the CloudBioLinux mailing list. Amazon web services provide scalable, on demand computational resources through their elastic compute cloud (EC2). Previously, I described the goal of providing publicly available machine images loaded with bioinformatics tools. I’m happy to describe an initial step in that direction: an automated build system, using easily editable configuration files, that generates a bioinformatics-focused Amazon Machine Image (AMI) containing packages integrated from several existing efforts. The hope is to consolidate the community’s open source work around a single, continuously improving, machine image. JCVI Cloud BioLinux — JCVI’s work porting Bio-Linux to the cloud. bioperl-max — Fortinbras’ package of BioPerl and associated informatics tools. MachetEC2 — An InfoChimps image loaded with data mining software. Each of these libraries inspired different aspects of developing this image and associated infrastructure, and I’m extremely grateful to the authors for their code, documentation and discussions. The current AMI is available for loading on EC2 — search for ‘CloudBioLinux’ in the AWS console or go to the CloudBioLinux project page for the latest AMIs. Automated scripts and configuration files with contained packages are available as a GitHub repository. This image is intended as a starting point for developing a community resource that provides biology and data-mining oriented software. Experienced developers should be able to fire up this image and expect to find the same up to date libraries and programs they have installed on their work machines. If their favorite package is missing it should be quick and easy to add, making the improvement available to future developers. Much more… Let us know what you are interested in. Documentation experts: provide cookbook style instructions to help others get started. Porting specialists: The automation infrastructure is dependent on having good ports for libraries and programs. Many widely used biological programs are not yet ported. Establishing a Debian or Ubuntu port for a missing program will not only help this effort, but make the programs more widely available. Systems administrators: The ultimate goal is to have the AMI be automatically updated on a regular basis with the latest changes. We’d like to set up an Amazon instance that pulls down the latest configuration, populates an image, builds the AMI, and then updates a central web page and REST API for getting the latest and greatest. Testers: Check that this runs on open source Eucalyptus clouds, additional linux distributions, and other cloud deployments. If any of this sounds interesting, please get in contact. The Cloud BioLinux mailing list is a good central point for discussion. main.yaml — The high level configuration file defining which groups of packages to install. This allows a user to build a custom image simply by commenting out those groups which are not of interest. packages.yaml — Defines debian/ubuntu packages to be installed. This leans heavily on the work of DebianMed and Bio-Linux communities, as well as all of the hard working package maintainers for the distributions. If it exists in package form, you can list it here. python-libs.yaml, r-libs.yaml — These take advantage of language specific ways of installing libraries. Currently implemented is support for Python library installation from the Python package index, and R library installation from CRAN and Bioconductor. This will be expanded to include support for other languages. The Fabric remote automated deployment tool is used to build AMIs from these configuration files. Written in Python, the fabfile automates the process of installing packages on the cloud machine. We hope that the straightforward architecture of the build system will encourage other developers to dig in and provide additional coverage of program and libraries through the configuration files. For those comfortable with Python, the fabfile is very accessible for adding in new functionality. If you are interested in face-to-face collaboration and will be in the Boston area on July 7th and 8th, check out Codefest 2010; it’ll be two enjoyable days of cloud informatics development. I’m looking forward to hearing from other developers who are interested in building and maintaining an easy to use, up to date, machine image that can help make biological computation more accessible to the community.